The Delaware Nation Facilities Department is committed to cleaning and maintaining the Delaware Nation tribal facilities utilized by tribal member and employees to effectively assure a safe, healthy sanitary environment for the public and visitors of the Delaware Nation. The facilities department will make an ongoing effort by making safety improvements and identifying small repairs and practicing preventative maintenance. 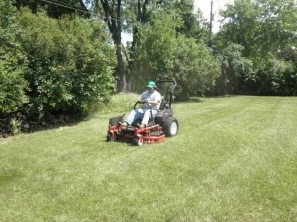 The Delaware Nation facilities manager offers services to Delaware tribal elders for lawn cutting during the summer season that qualify under the tribal elder lawn service guidelines. Delaware Nation is offering lawn mowing service to enrolled Delaware Nation elders during the summer months from April to August. To qualify for this service, A Delaware tribal elder must be 60 years of age or older on April 1st. Only the primary residence of the approved elder within a 40 mile radius of the Delaware Nation Complex will receive this service. Due to the fact that the Delaware Nation Maintenance staff have other responsibilities, this service will be offered on a first come first served basis, First preference will be given to the elders who are unable to care for their own lawn maintenance due to physical or mental limitations. All other applicants will be placed on a waiting list and notified when service is provided. Lawn services are currently provided to 14 Delaware Nation elders with the Hall of Fame Museum and Green Tech included.